Here's the so-called suicide note from the BD case. I think that it was just a ruse to steer the thinking of the investigators in the wrong direction. It has the same little games and hints that many of his writings had. Also here; is a copy of a newspaper article about how it was found. Notice the Joo(Jew hint) structure that he integrated into it, which is very similar to the one on the Ramsey ransom note. The Donald Wolfe book about the Black Dahlia murder makes the most sense to me in terms of the actual motive behind the way the victim was treated and left on display. He attributes it to Bugsy Siegel, a Jewish mobster who was an associate of Meyer Lansky, also a Jewish mobster. Maybe this was simply a ploy by Zodiac Jack to divert investigators thinking? However, I tend to think that the big gangs of those days had eyes and ears on the streets and knew what went down on their own turf. The point is; that you have these similar hints 49 years apart. There may be joo/Jew hints on the Zodiac killer documents too, I'll have to go back and look. There are more details to this part of the story that others have noted, like who Ed Burns really was, etc. I placed several key documents in this thread a few pages back. I'll add a few more in the near future. 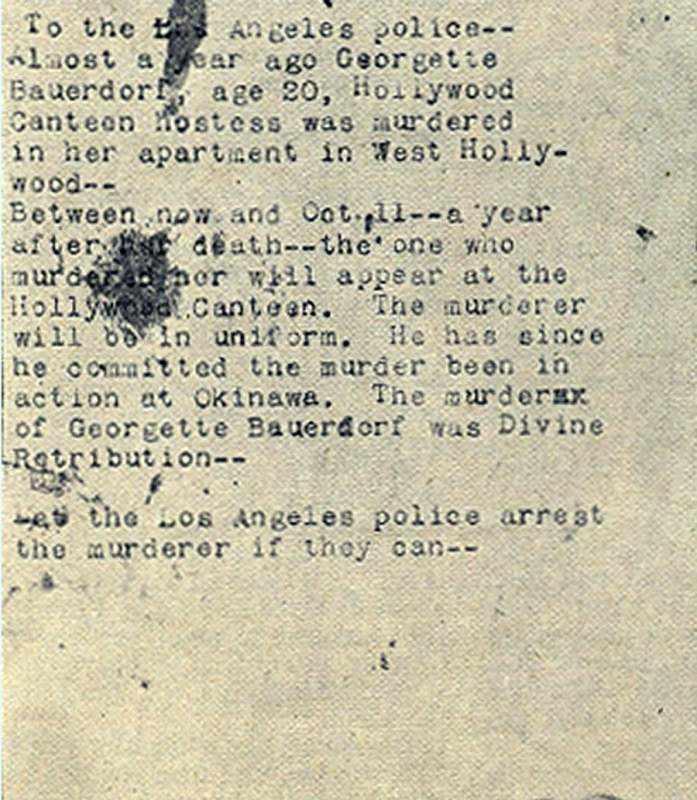 This is from the Georgette Bauerdorf murder case, a case that many investigators believed to be linked to the Black Dahlia case. Notice the taunt about "Divine Retribution". 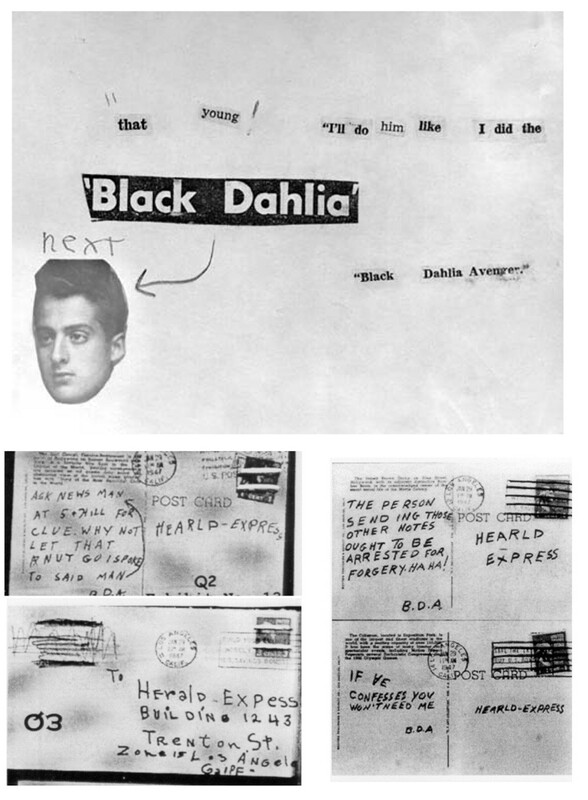 This demonstrates this killers emerging theme, linked by keywords and statements like killing the "Black Dahlia was justified." All of the above is Zodiac Jack 101. Same identical crap from this killer.... keywords and key phrases like: "this is next", "he is next", "wait till next time" etc. This killer integrated his initials JT on all of the related crime documents. Artistic nuances, intentionally misspelled words, signatory elements, felt tipped pen, taunting everyone, printed cryptic sign-offs with periods. Victims 'left on display' to convey how bold and ruthless he was. All part of a pattern of threatening and shaking down wealthy people. Black Dahlia/E.Short's body had a fake hysterectomy wound which I believe to be a prime clue to the true motive behind these killings. Judging by all of the documents that I've read regarding these related cases, there was also a pattern of rigging in more than one 'default' fall guys or patsy's into these crimes, Dr George Hodel having been one of them. I've posted several documents in this and other recent thread postings. You'll have to go back several pages to see them. The totality of the evidence clearly supports most of what I've said about these crimes. If I recognize that I've been mistaken or there's a conflict about anything, I'll certainly address it. I don't waist my time on flamers or trolls. There are several conflicting reports in all of these cases, one has to try to ferret out which reports are accurate. A lot of pertinent information on the Black Dahlia case is not offered on most web sites that specialize in the case or it's been downplayed or ignored. I've read that E. Short was said to be fixated with the Degnan case. I've also read that she was trying avoid some people and was living in great fear for her life her last few days. This makes sense also when you review her last known movements and her last letter to a guy named Fickling in which she said she was going to Chicago with 'Jack' to do some modeling. I believe that the fake hysterectomy wounds on E. Short's pelvis offers the best clue in understanding the true motive behind her gruesome death. I recommend Donald Wolfe's book "The Mob, the Mogul and the Murder That Transfixed Los Angeles". His take on the Black Dahlia case makes the most sense and especially with regard to the fake hysterectomy wound on the victim. Her body parts were laid out so that the morning sunlight shined straight through her pelvis and her body parts were positioned to resemble the letters JT or JW depending on how you wanna view it. Her body parts were drained of blood and washed. The same goes for the little Degnan girl's dismembered body. I don't believe that it took a trained surgeon to bisect E. Short's remains but certainly it was done by someone with experience and someone that was a fanatic. We've linked the Black Dahlia case in the past, and only recently realized that BD's posed remains were discovered at 34.0164°N 118.333°W. 118.330 degrees west, would have put her on Degnan Blvd, which leads into So Norton from the south. 118*** being the key clue. JonBenet's posed remains were a mimic of the BD's remains. The Ramsey case has three references to the 118,*** figure. BD case, Zodiac and Ramsey case, to name three, have fOllOw, Flov, and FolLaw solid hints. Flova was Jack Tarrance's mothers middle name. All of these and other cases had "jack" hints. For example, all pictures sent in in Zodiac era had only one "noun" in common, that noun is the word "jack". BTW, Dahlia case had a "Sorry Ma" hint on the phony Ed Burns suicide note. This guy most definitely left a trail he wanted "FolLawed(sic)." Go look...and zoom out and read the road names: Three key breakthroughs on the Ramsey ransom note came on: 1) 09-20-16, with the letter d's. 2) 11-20-16, the same for the letter p's. 3) And on 02-20-17, when I easily decoded the "Victory ! S.B.t.C" sign off, and it points to a very definitive set of coordinates in the state of Michigan. All of the letter d's are shaped like nooses, with the one in the word "dog," which depicts the device used to throttle JonBenet to death, T-handle and all. Prior to this I was puzzled by the way the letter p's were shaped and I had grouped them in a column in order to study them. Well, in fact, they were drawn to resemble male genitalia and act as pointers. Upon studying the last letter p, I came to realize that it strongly hints at both Detroit and Lake Michigan and points to "Victory! S.B.t.C". The letter V hints to double as a backwards stemmed letter N and the letter i hints and doubles as a colon. Using a very simple alphabet to number table, the cryptic sign off easily and obviously decodes to: N42.015182 -86.192203. This decoding involves the realization that the letter c in Victory also hints and doubles as a letter J laying on it's back. It's first significant digit is used to raise the value of the c, which equals 3, to a value of 4. From there the rest of the solve is straightforward. The nearest intersection to this solve is Garret Rd (a garrote hint) and Burke St. The "paper" over "between" hint results in the letters "peep", which easily renders 165516, which, in turn offers up -86.165516, which in turn puts you on the northbound lane of Burke St. BTW, The state of Michigan has a longitude range of between -83 to -86, -86 is nearest Lake Michigan. In the world of coded messages, this is a very simple and rather rudimentary encryption. By strict definition, this evidence is truly "empirical". Go Look! Zoom out a little. I used Google maps for this. While it's been staring everybody in the face, John Ramsey's bonus pay, was said to be $118,117.50, which is 50 cents shy of $118,118! Who calculated his bonus check amount? That makes it the 4th 118 hint in the Ramsey case. 1ea on the ransom note, 1ea with the bible in his study, with Psalms 118 dogeared, and 1ea with his bonus pay, which if you round off to the nearest dollar, it would make it $118,118! A mere coincidence?...No way!